In this day and age, we happen to be lucky enough to carry around a portable museum of gaming. One that obtains the imagination and history of developers from the likes of Capcom, SNK, SEGA and, oddly, just a pinch of old school Nintendo. The Nintendo Switch itself may not have a Virtual Console in the same way that the waggle of the Wii had, but there’s no denying that a recent boom of gaming retrospective compilations has seen to it that our nostalgic taste buds are well met. Atari is the latest to slam a catalogue of emulation onto our hybrid system with a whopping 150 games no less, derived from their heyday of both the home console and arcade market that had some of the core, underpinning foundations of many games we all play today. Before we go any further, one thing must be said. Unsurprisingly, out of such a robust collection of classics -besides the arcade ports – there aren’t many games here that remotely hold up to the test of time. Many of these games were coined up during an experimental age of bedroom programming and before Nintendo would slap the famous Seal of Quality badge that would later be found on NES software. It could even be argued that some of the games in this collection played their part in the infamous video game crash of 1983 outside that disastrous E.T. travesty that was literally buried in droves. If you’re expecting an encyclopedia of sheer gaming magic, then Atari Flashback Classics is probably not for you. In any case, if you’re like me and adore the idea of collecting gaming history – warts and all – then this may very well be of high interest. There are some diamonds to still be found here, many of which now heavily influence quick-fix indie games across the mobile and console market. Games such as Asteroids, Tempest, Centipede and Breakout will light a match in the mind of even the younger generation of their existence. While a small game called Adventure will hit home to fans of Steven Spielberg’s latest video game romp based on the hit novel by Ernest Cline’s, Ready Player One. Unfortunately, more famous third-party partners such as Taito, Namco, Konami and Williams are nowhere to be found. So those who what to blast out some Space Invaders, Defender, Frogger or classic Pac-Man will have to go hunt somewhere else. The package is very sports-heavy also, considering that sports games never really became any good until the ’90s does make quite a large chunk of this collection even more redundantly perceived by today’s standards. What I did appreciate is how Atari Flashback Classics does have multiple versions of the same game released on three different platforms. The collection mainly focuses on the Atari 2600, 5200 and the arcade. To have the leisure to quickly swap between them to see how much more powerful and precise the coin-op generation really was in comparison to the home console counterparts is a sight to behold. The Asteroids emulation, for example, does its best to reflect the vector technology found within the early cabinets which still looks very clean in motion even in this day and age. The Atari 2600 port, however, is an ugly mess and barely playable in contrast. To rate Atari Flashback Classics based on graphics, gameplay, sound etc, entirely on its core content would be like shooting an old famous racehorse on the same day of celebrating its own past legacy. What’s important here is how the collection has been preserved and presented to both educate and set the mood of the time period from which it consists from. The interface in which everything is placed is much cleaner and easy to navigate than I had expected it to be, compiled seamlessly together in structure from how the games were recently split into volumes on other platforms. Each game has either the original arcade cabinet or box art to represent themselves with. There are scans of original manuals for games that had them, arcade screen borders to give a somewhat reflection of a cabinet, as well as an option to flip the portable screen in Tate mode for games that were played in such fashion. The customisation options of screen filters, system settings and gameplay options have also had some tender loving care paid to them. However, it would have been nice to see a date of release and a small blurb of information to provide some insight to each game, but, to be fair, I was still surprised at how well Atari Flashback Classics is presented on the forefront in an effort not to just look like a bootleg emulation list. Especially with the addition of an Xbox-style achievement system for the small few to aim for. The default controller setup works fine, for the most part, to compensate for the peripherals that were originally used and can be adjusted to suit the player’s preference. This feature is particularly handy as the analogue stick is incredibly sensitive by default – making some games even more unplayable then they already are. Many of these games do have a multiplayer option with Warlords being a personal favourite of mine. PONG also being here is a necessity to feed the absolute primary example of original competitive gaming. Switching between split Joy-Con to a solo player is simple and convenient when exiting a multiplayer game to the main menu. There’s also online multiplayer available for a gang of games if you’re incredibly lucky enough to find someone to play with. If not, there’s always online leaderboards to show off your piloting skills in Tempest. 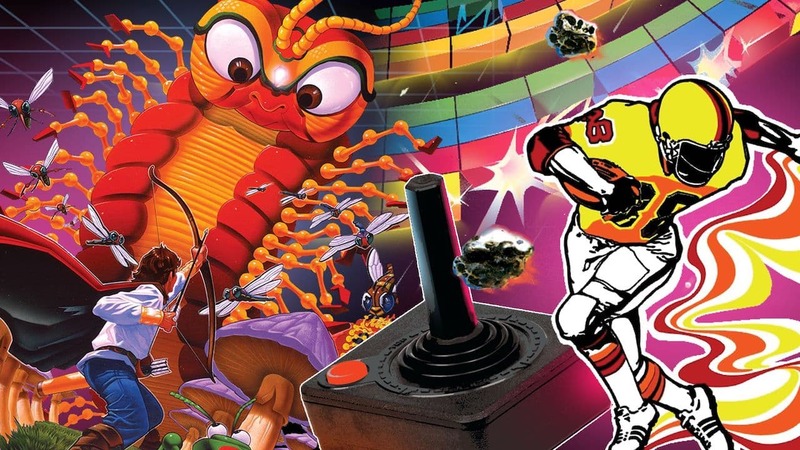 Atari Flashback Classics may be missing some slices of the golden age of arcade history, but the licences and features it does have are enough to warrant a purchase for the casual collector. Despite there being a huge amount of games on offer, a lot of them are either copycat concoctions of more successful games which are still found here or multiple system ports of the same game. It’s also more of a collection for the old school fan to simply tinker through rather than to bang hours besting high scores and playing to completion. Either way, it does stand as a cheaper and more convenient alternative to Atari’s physical renditions found in your local gadget shop with the added benefit of quality emulation of true arcade classics.